The images shown are by courtesy of the Trustees of the Enfield (M.O.D.) Pattern Room Collection - late of the R.S.A.F. ( Royal Small Arms Factory), Nottingham, and now gifted to the Royal Armouries Museum at Leeds. The collection still continues as a working reference library for Small Arms of the World and maintains its acquisitive remit to that end. The L98A1 Rifle is a full-calibre (.223"), non self-loading modified version of the "Individual Weapon" L85A1 - SA80 Service rifle for Cadet and training use. The action can only be cycled manually by use of the cocking lever. 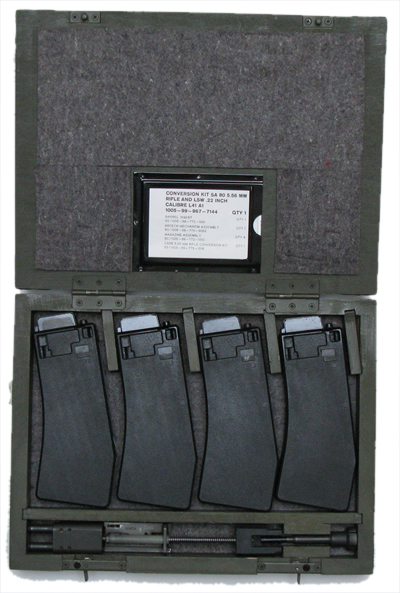 Each round is loaded from the magazine in this way and there is no option for either semi-automatic or fully-automatic selective fire as is available on the L85A1. 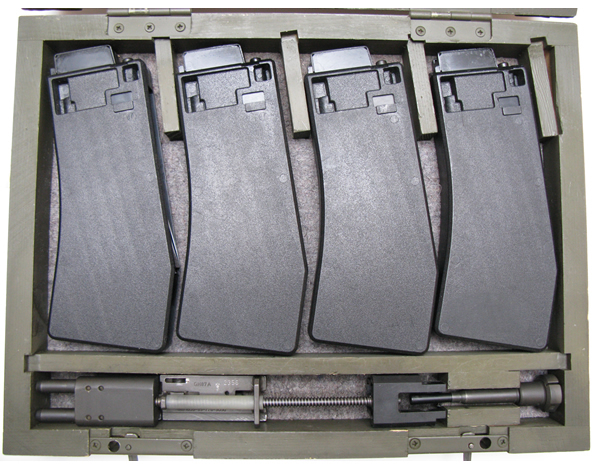 Additionally, the rifle can itself be fitted with a .22RF (rim-fire) small-bore conversion unit to permit equivalent magazine-fed, but single action, use on indoor or small-bore ranges. This training arm is in current use by the British Military, although there is a replacement model mooted. The intention is to provide the cadet force with a semi-automatic version of the L98A1 in the coming years; this rifle would still exclude any option for true selective fully-automatic fire.This new Cadet rifle is expected to effectively be a modified L85A2 (SA80) Individual Weapon rather than a purpose built model. It will probably be the Service rifle with the trigger system altered by removal of the interceptor sear which permits fully-automatic fire, and the locking-up of the safety sear into a position where only semi-automatic fire can be obtained. 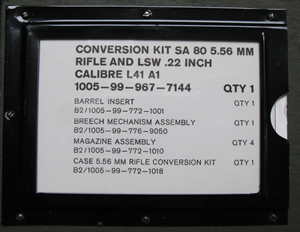 The modifications to the trigger group are supposedly designed to make impractical any unauthorised backward conversion to re-enable fully automatic fire. Below, is a side elevation of the rifle with the breech block in the forward (closed) position. This example is the original Government Pattern arm. 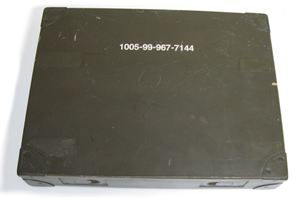 From 1998 all in-service rifles were retro-fitted with modified cocking handles. 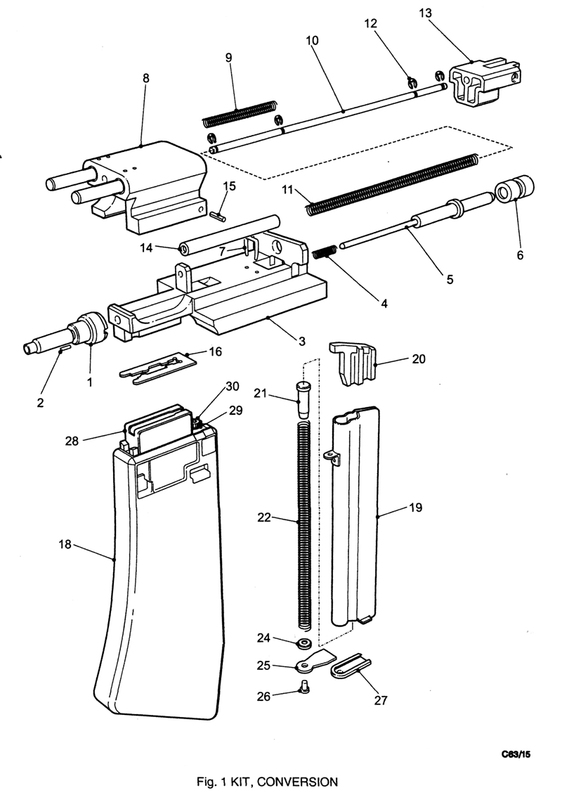 Whilst, below, it is shown with the cocking lever pulled back, ejection port open and the breech-block to the rear. As standard issue, the Cadet GP ( General Purpose ) rifle is fitted with iron sights, but it can also be fitted with the 4 power SUSAT optical sight (Sight Unit, Small Arms, Trilux) more usually seen on the full service arm - the L85A1 - SA80, for which the L98A1 was the training version. Also manufactured was an equivalent version of the L86A1 LSW ( Light Support Weapon ). The standard LSW is fitted with a longer barrel and a bi-pod. The non semi-automatic version was only sold on the commercial market and not adopted by the British Government for Service use. Below, loosely describable as a training rifle, in parade ground terms at least, the DP (Drill Purpose) deactivated rifle, the latter day equivalent to the L59A1 and A2 DP Rifles of the 1970s. Further detail will appear on this page in due course.